The system warms and cools your body in time with your natural circadian rhythm. Consumer goods conglomerate Jarden—which builds everything from coffee makers and crock pots to camp stoves and fishing gear—is entering the fledgling market for high-tech sleep aids. And as a number of equally large manufacturers have done lately, Jarden turned to crowd funding to see how receptive consumers might be to this idea. Their Indiegogo campaign exceeded its goal in less than a week. The Health o meter Nuyu Sleep System is designed to keep your bed at the ideal temperature for sleep, adjusting through the night in sync with your body’s circadian rhythm. This is accomplished through a torso-sized pad that you place on top of your sheets. 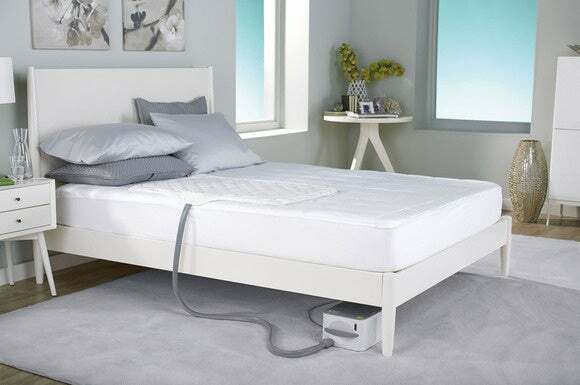 The pad connects to a small machine that circulates temperature-controlled water (ranging from 67- to 105 degrees Fahrenheit) through the pad while you sleep. It’s not as straightforward as it sounds, though. The company says determining just the right temperature is a fairly complicated undertaking that must take a number of factors into account, such that the company’s engineers had to develop a complex algorithm based on the sleeper’s age, height and weight, temperature preferences, and the ambient room temperature. 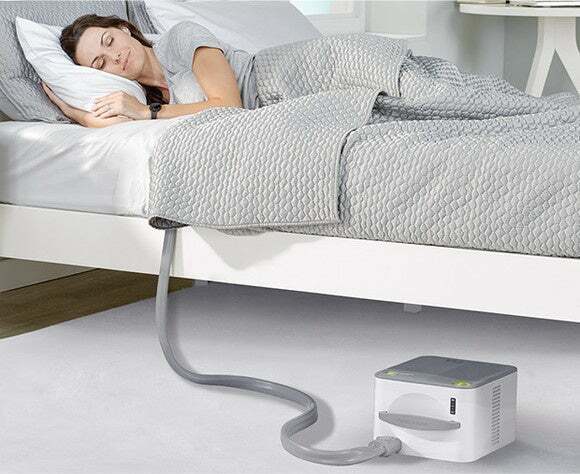 The Nuyu Sleep System pumps water through a pad that you place on top of your mattress. “When you are going to sleep, the Sleep System warms you up. Then, it cools you down during the middle of the night, and then warms you back up naturally,” reads the official product page. According to the company, various studies have shown that there is a direct relationship between sleep quality and the application of incremental heating or cooling to your core. A short hose connects the pad to a 17-ounce water tank and control unit. An onboard Bluetooth radio enables you to control the entire thing via a mobile app. You use the app to input the personal information the algorithm needs, but you can manually adjust the temperature of the pad if the results aren’t to your liking. If you find the Sleep System appealing enough to back before it reaches the market (and the hands of product reviewers), Jarden is offering several pre-order specials, including a 50-percent discount from the $500 list price (with an expected delivery date in November). Why this matters: We need adequate sleep to be happy, productive, and healthy. And we spend tens of billions of dollars on all kinds of sleep-aids each and every year. A solution that doesn’t involve imbibing chemicals sounds very appealing, and the science behind the Sleep System sounds reasonable enough. Jarden also offers a 90-day money-back guarantee if you’re not 100 percent satisfied, which is not something you often see with crowd-funding campaigns.